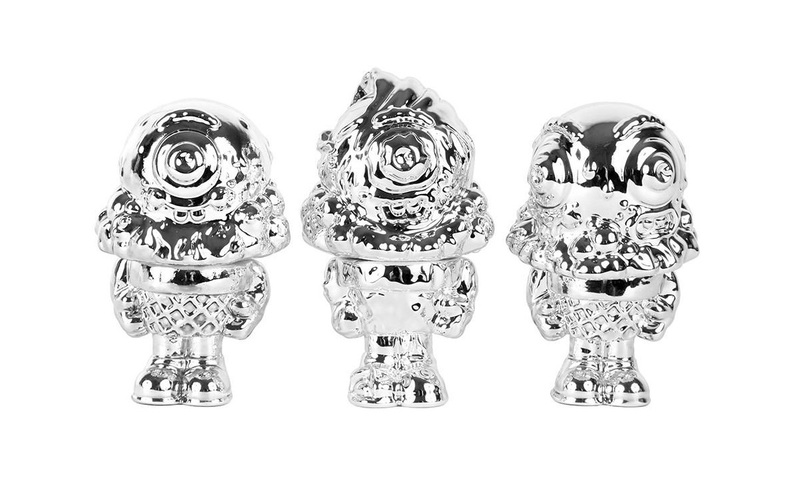 For the first time ever, Buff Monster has released all three of his Mister Melty figures in silver chrome! This amazing Silver Chrome Mister Melty Set includes the standard OG head, the 2 Faced head and the Zombie head. These figures were originally cast in soft Japanese vinyl (the 2 Faced head is mixed vinyl/resin) and then plated in super shiny silver chrome. Each figure stands 3” tall and comes packaged in a black velvet bag. 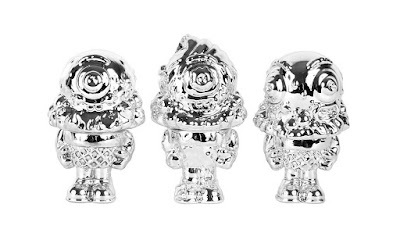 Sold only as a 3 piece set and limited to just 10 sets in all, these Silver Chrome Mister Melty figures retailed for $120 at the Stay Melty online store. Sadly these sold out almost immediately upon release today, Friday, August 18th.